Cloning is the creation of an organism that is an exact genetic copy of another. This means that every single bit of DNA is the same between the two. Artificial embryo twinning is the relatively low-tech version of cloning. This technology mimics the natural process of creating identical twins. Naturally, twins are the result of two different eggs becoming fertilized by two sperm cells. In rare cases, one fertilized egg divides into a two-celled embryo. These two cells continue to divide on its own however since they came from the same fertilized egg, they are genetically identical. Artificial embryo twinning uses the same approach; however it occurs in a Petri dish. This is accomplished by manually separating a very early embryo into individual cell. The resulting embryos are placed into a surrogate mother, where they are carried to term and delivered. Again, since all the embryos came from the same fertilized egg, they are genetically identical. Somatic Cell Nuclear Transfer: uses a different approach than artificial embryo twinning, but it produces the same result: an exact clone, or genetic copy, of an individual. This was the method used to create Dolly the Sheep. Somatic Cell: A somatic cell is any cell in the body other than the two types of reproductive cells, sperm and egg. Sperm and egg are also called germ cells. In mammals, every somatic cell has two complete sets of chromosomes, whereas the germ cells only have one complete set. How was Dolly the Sheep made? To make Dolly, researchers isolated a somatic cell from an adult female sheep. Next, they transferred the nucleus from that cell to an egg cell from which the nucleus had been removed. After a couple of chemical tweaks, the egg cell, with its new nucleus, was behaving just like a freshly fertilized zygote. It developed into an embryo, which was implanted into a surrogate mother and carried to term. 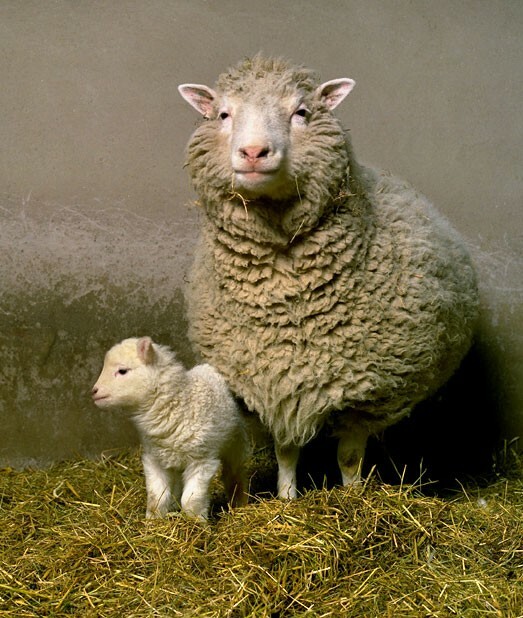 The lamb, Dolly, was an exact genetic replica of the adult female sheep that donated the somatic cell nucleus to the egg. She was the first-ever mammal to be cloned from an adult somatic cell. In fertilization, the sperm and egg both contain one set of chromosomes. When the sperm and egg join, the resulting zygote ends up with two sets - one from the father (sperm) and one from the mother (egg). In SCNT, the egg cell's single set of chromosomes is removed. It is replaced by the nucleus from a somatic cell, which already contains two complete sets of chromosomes. Therefore, in the resulting embryo, both sets of chromosomes come from the somatic cell. What has Cloning got to do with genetic mutations? Cloning is a type of genetic modification. Instead of allowing cells develop naturally, humans are interfering and therefore ‘genetically modifying’ a cell. For example, In the Somatic Cell Nucleus Transfer method, the egg’s cell’s single set of chromosomes is removed and replaced by the nucleus from a somatic cell, genetically modifying a cell. Most of the ethical issues of cloning be it in animals or humans have been raised by the Catholic Church, as well as other religious organizations. They all strongly oppose cloning as according to the religious belief life begins at conception and that life cannot be created artificially but from the unity of a man and female. Another ethical issue revolves around the technical and medical safety of cloning. Birth defects are much higher than that of natural birth.